From case studies and statistics, to current stories of value, rights, strategies, and pitfalls from the technology domain: a beginning framework for understanding Intellectual Property issues will be shared. 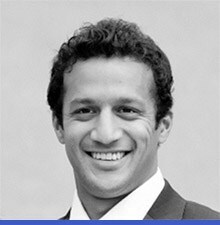 Anil is the founder and managing partner of BHOLE IP LAW. Anil is licensed by the Law Society of Upper Canada to practice law in Ontario. He is also a qualified Canadian patent agent and Canadian trade-mark agent. He is further qualified by the United States Patent and Trademark Office to file and prosecute U.S. patent applications on behalf of Canadian applicants. Anil holds a bachelor’s degree in Computer Engineering from the University of Waterloo and worked in embedded software development prior to entering the legal profession. His legal career is diverse, having practiced at an IP boutique law firm as well as two national full service law firms in their IP groups. This experience has exposed Anil to a vast array of legal work, from patent and trade-mark prosecution and technology licensing to the IP issues raised in M&A and securities offerings. Anil has a particularly strong experience in the emerging areas of neural networks/machine learning, including foundational machine learning technologies as well applications including image processing, natural language processing, and analytics. Beyond these areas, Anil’s clients span the spectrum from social networking, e-commerce, location based services, mobile applications, mobile devices and digital hardware all the way to mechanical consumer goods and appliances.